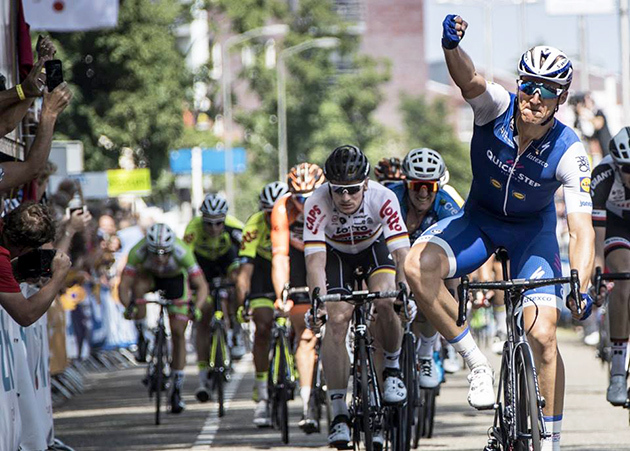 The race: Here's the stage story from winner Marcel Kittel's Quick Step team. A perfectly-executed sprint landed Marcel Kittel his ninth victory of the season, and his fifth in the Ster ZLM Toer, capping off an impressive week for Quick-Step Floors at the Dutch race. The German kicked off at 150 meters to go and held off the challenge of Dylan Groenewegen (LottoNL-Jumbo), crossing the finish line a bike length clear of his opponent to give the team its 32nd UCI win of the year. Quick-Step Floors stamped its authority on stage 4 (Oss – Oss, 180.9 kilometers), controlling the original escape and the solo attacks which followed in the last 20 kilometers, before delivering Marcel Kittel in an ideal position from which he launched his trademark devastating sprint. Our team was a key player also in the general classification, where 21-year-old Laurens De Plus finished third, just 13 seconds down on winner Jose Goncalves (Katusha-Alpecin), courtesy of a sterling effort on the race's queen-stage, while neo-pro Maximilian Schachmann closed out the race in fourth place, his best outing since turning pro in January, both results coming as a confirmation of what's to come in the future from the two youngsters. "It was a nice and quiet day on the bike, and I must say it was quite unusual to ride in the Netherlands and don't face any strong winds. The guys rode a perfect race today; we took the front early, because we knew we had to be there before the last kilometer on this type of finish. I'm happy I could capitalize on my team's fine job and get a nice victory two weeks from the start of the Tour de France, especially after the bad luck I had on the first road stage here", said Marcel Kittel after the race which saw Quick-Step Floors finish at the top of the team standings, which the squad led ever since day one. From here, the 29-year-old sprinter will go home, before making his fifth consecutive appearance at the National Championships, scheduled next Sunday: "I'm excited about racing the Nationals, although it's always an unpredictible affair, and with just two guys in the race it will be impossible to control it. But together with Max we will give our best out there and try to play our card. If it doesn't end up in a bunch sprint, then I'll come out of this with the joy of riding in front of my home fans and adding some extra kilometers under the belt before the Tour de France." 2 Dylan GROENEWEGEN Lotto NL-Jumbo s.t. 3 André GREIPEL Lotto Soudal s.t. 4 Timothy DUPONT Veranda's Willems-Crelan s.t. 5 Max WALSCHEID Sunweb s.t. 6 Raymond KREDER Roompot-Nederlandse Loterij s.t. 7 Bert VAN LERBERGHE Sport Vlaanderen-Baloise s.t. 8 Coen VERMELTFOORT Roompot-Nederlandse Loterij s.t. 9 Christophe LAPORTE Cofidis s.t. 10 Kevin ISTA WB Veranclassic s.t. 11 Iljo KEISSE Quick-Step s.t. 12 Kenny DEHAES Wanty-Groupe Gobert s.t. 13 José GONÇALVES Katusha Alpecin s.t. 14 Jonas RICKAERT Sport Vlaanderen-Baloise s.t. 15 Arvid DE KLEIJN Baby Dump s.t. 16 Twan BRUSSELMAN Destil-Jo Piels s.t. 17 Dries VAN GESTEL Sport Vlaanderen-Baloise s.t. 18 Alex KIRSCH WB Veranclassic s.t. 19 Thomas LEEZER Lotto NL-Jumbo s.t. 20 Michaël VAN STAEYEN Cofidis s.t. 21 Zico WAEYTENS Sunweb s.t. 22 Jasper DE BUYST Lotto Soudal s.t. 23 Maximilian SCHACHMANN Quick-Step s.t. 24 Andre LOOIJ Roompot-Nederlandse Loterij s.t. 25 Piet ALLEGAERT Sport Vlaanderen-Baloise s.t. 26 Oscar RIESEBEEK Roompot-Nederlandse Loterij s.t. 27 Jasper DE LAAT MET s.t. 28 Laurens DE PLUS Quick-Step s.t. 29 René HOOGHIEMSTER Baby Dump s.t. 30 Simone ANTONINI Wanty-Groupe Gobert s.t. 31 Hugo Hofstetter Cofidis s.t. 32 Maarten DE JONGE Monkey Town s.t. 33 Fabio SABATINI Quick-Step s.t. 34 Viacheslav KUZNETSOV Katusha Alpecin s.t. 35 Sjoerd VAN GINNEKEN Roompot-Nederlandse Loterij s.t. 36 Florian SENECHAL Cofidis s.t. 37 Sébastien DELFOSSE WB Veranclassic s.t. 38 Søren Kragh ANDERSEN Sunweb s.t. 39 Maarten WYNANTS Lotto NL-Jumbo s.t. 40 Lars Ytting BAK Lotto Soudal s.t. 41 Timo ROOSEN Lotto NL-Jumbo s.t. 42 Tim MERLIER Veranda's Willems-Crelan s.t. 43 Maxime VANTOMME WB Veranclassic s.t. 44 Gijs VAN HOECKE Lotto NL-Jumbo s.t. 45 Marco ZANOTTI Monkey Town s.t. 46 Fabien DOUBEY Wanty-Groupe Gobert s.t. 47 Toon AERTS Telenet Fidea s.t. 48 Primož ROGLIC Lotto NL-Jumbo s.t. 49 Wesley KREDER Wanty-Groupe Gobert s.t. 50 Joris BLOKKER Monkey Town s.t. 51 Kevin VAN MELSEN Wanty-Groupe Gobert s.t. 52 Jim LINDENBURG Metec-TKH s.t. 53 Thomas SPRENGERS Sport Vlaanderen-Baloise s.t. 54 Johannes FRÖHLINGER Sunweb s.t. 55 Antoine WARNIER WB Veranclassic s.t. 56 Michael GOOLAERTS Veranda's Willems-Crelan s.t. 59 Stan GODRIE Veranda's Willems-Crelan s.t. 60 Jimmy TURGIS Cofidis s.t. 61 Tim KERKHOF Destil-Jo Piels s.t. 62 Rémi Cavagna Quick-Step s.t. 63 Jarno GMELICH MEIJLING Metec-TKH s.t. 64 Sindre SKJOESTAD LUNKE Sunweb s.t. 65 Eliot LIETAER Sport Vlaanderen-Baloise s.t. 66 Lennard KÄMNA Sunweb s.t. 67 Nicolas CLEPPE Telenet Fidea s.t. 68 Robbert DE GREEF Baby Dump s.t. 69 Dion BEUKEBOOM Destil-Jo Piels s.t. 70 Peter SCHULTING Destil-Jo Piels s.t. 71 Lars VAN DER HAAR Telenet Fidea s.t. 72 Berden DE VRIES Roompot-Nederlandse Loterij s.t. 73 Gert-Jan BOSMAN Destil-Jo Piels s.t. 74 Marco DOETS Baby Dump s.t. 75 Corne VAN KESSEL Telenet Fidea s.t. 76 Preben VAN HECKE Sport Vlaanderen-Baloise s.t. 77 Gregory HABEAUX WB Veranclassic s.t. 78 Lukas SPENGLER WB Veranclassic s.t. 79 Daan SOETE Telenet Fidea s.t. 80 Quinten HERMANS Telenet Fidea s.t. 93 Bert DE BACKER Sunweb s.t. 94 Stijn DEVOLDER Veranda's Willems-Crelan s.t. 97 Thijs AERTS Telenet Fidea s.t. 100 Jasper HAMELINK Metec-TKH s.t. 101 Joey VAN RHEE Destil-Jo Piels s.t. 102 Dylan BOUWMANS Metec-TKH s.t. 103 Jelle NIEUWPOORT Metec-TKH s.t. 104 Rick VAN BREDA Monkey Town s.t. 108 Patrick VAN DER DUIN Baby Dump s.t. 109 Jim AERNOUTS Telenet Fidea s.t. 110 Enzo WOUTERS Lotto Soudal s.t. 111 Maxim BELKOV Katusha Alpecin s.t. 112 Folkert OOSTRA Baby Dump s.t. 54 Fabio SABATINI Quick-Step s.t. 56 Joris BLOKKER Monkey Town s.t. 59 Preben VAN HECKE Sport Vlaanderen-Baloise s.t. 61 Robbert DE GREEF Baby Dump s.t. 66 Johannes FRÖHLINGER Sunweb s.t. 90 Hugo Hofstetter Cofidis s.t. 92 Arvid DE KLEIJN Baby Dump s.t. The race: Here's the report from stage winner and new GC leader José Gonçalves' Katusha-Alpecin team. Team KATUSHA ALPECIN’S José Gonçalves took full advantage of the good racing form he brought to the Netherlands and Belgium to win the 4th stage in the 2017 Ster ZLM Toer on Saturday. In the process, Gonçalves takes over the general classification with only one stage remaining to race. Joining a group of 7, the Portuguese rider was part of a two-man breakaway at 30k to go and managed to leave behind his companion Laurens De Plus of Quick-Step Floors and win the Queen stage by six-seconds. “I am feeling very good. I bring with me great form from last month’s Giro d’Italia. I think our team here is very good and especially strong. Today it was full gas. I tried to go alone near the end and managed to win. I am very happy with this jersey and we will do everything we can to defend the yellow jersey on the last day,” said José Gonçalves. Earlier in the stage teammate Maxim Belkov made the break, setting up the opportunity for Gonçalves to later bridge across in his quest to win the stage. Third place (+.22) belonged to former race leader Primož Roglič of LottoNL-Jumbo for the 186.7k stage from Hotel Verviers to the dam at La Gileppe (Jalhay) in the Ardennes. Gonçalves, 28, leads the general classification by 8-seconds to Roglič and ten-seconds to De Plus. It’s the first win of the season for José Gonçalves. Last year he won the Presidential Tour of Turkey and had stage wins there, as well as in the Volta a Portugal. 4 Maxime VANTOMME WB Veranclassic s.t. 6 Thomas SPRENGERS Sport Vlaanderen-Baloise s.t. 7 Alex KIRSCH WB Veranclassic s.t. 8 Toon AERTS Telenet Fidea s.t. 9 Florian SENECHAL Cofidis s.t. 10 Jasper DE LAAT Metec-TKH s.t. 11 Dries VAN GESTEL Sport Vlaanderen-Baloise s.t. 12 Jasper DE BUYST Lotto Soudal s.t. 13 Oscar RIESEBEEK Roompot-Nederlandse Loterij s.t. 14 Maximilian SCHACHMANN Quick-Step s.t. 15 Fabien DOUBEY Wanty-Groupe Gobert s.t. 16 Sjoerd VAN GINNEKEN Roompot-Nederlandse Loterij s.t. 22 Timo ROOSEN Lotto NL-Jumbo s.t. 23 André GREIPEL Lotto Soudal s.t. 28 Moreno HOFLAND Lotto Soudal s.t. 29 Kevin VAN MELSEN Wanty-Groupe Gobert s.t. 30 Maarten DE JONGE Monkey Town s.t. 31 Antoine WARNIER WB Veranclassic s.t. 32 Peter SCHULTING Destil-Jo Piels s.t. 33 Sébastien DELFOSSE WB Veranclassic s.t. 42 Wesley KREDER Wanty-Groupe Gobert s.t. 45 Jim LINDENBURG Metec-TKH s.t. 46 Joris BLOKKER Monkey Town s.t. 47 Jimmy TURGIS Cofidis s.t. 48 Marcel SIEBERG Lotto Soudal s.t. 49 Jarno GMELICH MEIJLING Metec-TKH s.t. 50 René HOOGHIEMSTER Baby Dump s.t. 51 Marco DOETS Baby Dump s.t. 52 Jonas RICKAERT Sport Vlaanderen-Baloise s.t. 53 Iljo KEISSE Quick-Step s.t. 54 Marcel KITTEL Quick-Step s.t. 55 Johannes FRÖHLINGER Sunweb s.t. 56 Nicolas CLEPPE Telenet Fidea s.t. 57 Bert DE BACKER Sunweb s.t. 58 Fabio SABATINI Quick-Step s.t. 59 Tim KERKHOF Destil-Jo Piels s.t. 60 Berden DE VRIES Roompot-Nederlandse Loterij s.t. 61 Mark MCNALLY Wanty-Groupe Gobert s.t. 62 Robbert DE GREEF Baby Dump s.t. 63 Gaetan BILLE Veranda's Willems-Crelan s.t. 64 Folkert OOSTRA Baby Dump s.t. 65 Dion BEUKEBOOM Destil-Jo Piels s.t. 66 Maarten WYNANTS Lotto NL-Jumbo s.t. 67 Corne VAN KESSEL Telenet Fidea s.t. 68 Michaël VAN STAEYEN Cofidis s.t. 69 Twan VAN DEN BRAND Destil-Jo Piels s.t. 70 Jim AERNOUTS Telenet Fidea s.t. 71 Stijn DEVOLDER Veranda's Willems-Crelan s.t. 72 Jenthe BIERMANS Katusha Alpecin s.t. 73 Jasper HAMELINK Metec-TKH s.t. 74 Zico WAEYTENS Sunweb s.t. 75 Preben VAN HECKE Sport Vlaanderen-Baloise s.t. 76 Thijs AERTS Telenet Fidea s.t. 77 Raymond KREDER Roompot-Nederlandse Loterij s.t. 78 Tim MERLIER Veranda's Willems-Crelan s.t. 79 Stijn STEELS Sport Vlaanderen-Baloise s.t. 80 Daan SOETE Telenet Fidea s.t. 82 Michael GOOLAERTS Veranda's Willems-Crelan s.t. 84 Coen VERMELTFOORT Roompot-Nederlandse Loterij s.t. 85 Stephan BAKKER Monkey Town s.t. 86 Brian VAN GOETHEM Roompot-Nederlandse Loterij s.t. 87 Max WALSCHEID Sunweb s.t. 88 Rens TE STROET Destil-Jo Piels s.t. 89 Rick VAN BREDA Monkey Town s.t. 90 Andre LOOIJ Roompot-Nederlandse Loterij s.t. 91 Marco ZANOTTI Monkey Town s.t. 93 Justin TIMMERMANS Baby Dump s.t. 94 Tijmen EISING Metec-TKH s.t. 95 Dylan GROENEWEGEN Lotto NL-Jumbo s.t. 96 Joey VAN RHEE Destil-Jo Piels s.t. 97 Lukas SPENGLER WB Veranclassic s.t. 98 Gijs VAN HOECKE Lotto NL-Jumbo s.t. 99 Sjoerd KOUWENHOVEN Metec-TKH s.t. 100 Dylan BOUWMANS Metec-TKH s.t. 101 Robert Thomas WAGNER Lotto NL-Jumbo s.t. 102 Julien STASSEN WB Veranclassic s.t. 103 Thomas LEEZER Lotto NL-Jumbo s.t. 104 Christophe LAPORTE Cofidis s.t. 105 Hugo Hofstetter Cofidis s.t. 106 Piet ALLEGAERT Sport Vlaanderen-Baloise s.t. 107 Kenny DEHAES Wanty-Groupe Gobert s.t. 108 Bert VAN LERBERGHE Sport Vlaanderen-Baloise s.t. 110 Patrick VAN DER DUIN Baby Dump s.t. 111 Stan GODRIE Veranda's Willems-Crelan s.t. 33 Mads Würtz SCHMIDT Katusha Alpecin s.t. 50 Lars VAN DER HAAR Telenet Fidea s.t. 55 Jenthe BIERMANS Katusha Alpecin s.t. 57 Preben VAN HECKE Sport Vlaanderen-Baloise s.t. 68 Marco DOETS Baby Dump s.t. 73 Johannes FRÖHLINGER Sunweb s.t. 80 Dylan GROENEWEGEN Lotto NL-Jumbo s.t. 82 Gijs VAN HOECKE Lotto NL-Jumbo s.t. 94 Gert-Jan BOSMAN Destil-Jo Piels s.t. 95 Hugo Hofstetter Cofidis s.t. 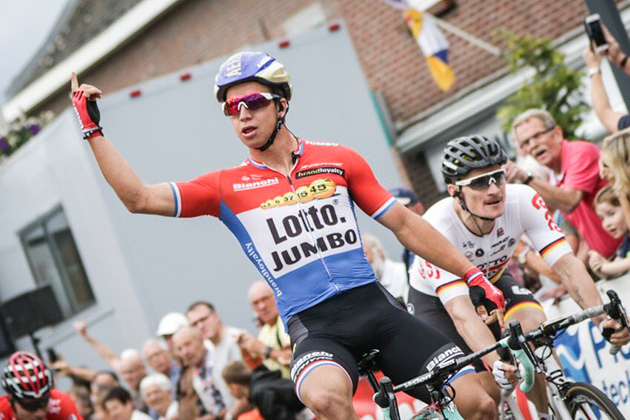 The race: Here's the report from winner Dylan Groenewegen's LottoNL-Jumbo team. Dylan Groenewegen followed up yesterday’s stage win with one in stage three of the Ster ZLM Toer today in Buchten, the Netherlands. The Dutchman of Team LottoNL-Jumbo defeated André Greipel and Moreno Hofland, making three team wins out of three with Primoz Roglic’s on day one. Despite a crash in the last three kilometres, Roglic remained the overall leader in the race. 2 André GREIPEL Lotto Soudal s.t. 3 Moreno HOFLAND Lotto Soudal s.t. 5 Kevin ISTA WB Veranclassic s.t. 7 Coen VERMELTFOORT Roompot-Nederlandse Loterij s.t. 8 Andre LOOIJ Roompot-Nederlandse Loterij s.t. 9 Mads Würtz SCHMIDT Katusha Alpecin s.t. 10 Max WALSCHEID Sunweb s.t. 11 Robert Thomas WAGNER Lotto NL-Jumbo s.t. 12 Corne VAN KESSEL Telenet Fidea s.t. 13 Dries VAN GESTEL Sport Vlaanderen-Baloise s.t. 14 Kenny DEHAES Wanty-Groupe Gobert s.t. 15 Søren Kragh ANDERSEN Sunweb s.t. 16 Arvid DE KLEIJN Baby Dump s.t. 17 Alex KIRSCH WB Veranclassic s.t. 18 Pim LIGTHART Roompot-Nederlandse Loterij s.t. 19 Bert VAN LERBERGHE Sport Vlaanderen-Baloise s.t. 20 Viacheslav KUZNETSOV Katusha Alpecin s.t. 21 Laurens DE PLUS Quick-Step s.t. 22 Maxime VANTOMME WB Veranclassic s.t. 23 Lars VAN DER HAAR Telenet Fidea s.t. 24 José GONÇALVES Katusha Alpecin s.t. 25 Thomas SPRENGERS Sport Vlaanderen-Baloise s.t. 26 Tim MERLIER Veranda's Willems-Crelan s.t. 27 Michaël VAN STAEYEN Cofidis s.t. 28 Toon AERTS Telenet Fidea s.t. 29 Sjoerd VAN GINNEKEN Roompot-Nederlandse Loterij s.t. 30 Sébastien DELFOSSE WB Veranclassic s.t. 31 Thomas LEEZER Lotto NL-Jumbo s.t. 32 Twan BRUSSELMAN Destil-Jo Piels s.t. 33 Jim AERNOUTS Telenet Fidea s.t. 34 Lars Ytting BAK Lotto Soudal s.t. 35 Oscar RIESEBEEK Roompot-Nederlandse Loterij s.t. 36 Gregory HABEAUX WB Veranclassic s.t. 37 Marco ZANOTTI Monkey Town s.t. 38 Timo ROOSEN Lotto NL-Jumbo s.t. 39 Jasper DE LAAT Metec-TKH s.t. 40 Marcel KITTEL Quick-Step s.t. 41 Jim LINDENBURG Metec-TKH s.t. 42 Jasper DE BUYST Lotto Soudal s.t. 43 Marcel SIEBERG Lotto Soudal s.t. 44 Julien STASSEN WB Veranclassic s.t. 45 Rick OTTEMA Baby Dump s.t. 46 Quinten HERMANS Telenet Fidea s.t. 47 Johannes FRÖHLINGER Sunweb s.t. 48 Hugo Hofstetter Cofidis s.t. 49 Fabio SABATINI Quick-Step s.t. 50 Maarten WYNANTS Lotto NL-Jumbo s.t. 51 Michael GOOLAERTS Veranda's Willems-Crelan s.t. 52 Kris BOECKMANS Lotto Soudal s.t. 53 Florian SENECHAL Cofidis s.t. 54 Zico WAEYTENS Sunweb s.t. 55 Wesley KREDER Wanty-Groupe Gobert s.t. 56 Fabien DOUBEY Wanty-Groupe Gobert s.t. 57 Antoine WARNIER WB Veranclassic s.t. 58 Nicolas CLEPPE Telenet Fidea s.t. 59 Rémi Cavagna Quick-Step s.t. 60 Marco MATHIS Katusha Alpecin s.t. 61 Lennard KÄMNA Sunweb s.t. 62 Maarten DE JONGE Monkey Town s.t. 63 Tim KERKHOF Destil-Jo Piels s.t. 64 Brian VAN GOETHEM Roompot-Nederlandse Loterij s.t. 65 Danilo NAPOLITANO Wanty-Groupe Gobert s.t. 66 Kevin VAN MELSEN Wanty-Groupe Gobert s.t. 67 Sjoerd KOUWENHOVEN Metec-TKH s.t. 68 Raymond KREDER Roompot-Nederlandse Loterij s.t. 69 Bert DE BACKER Sunweb s.t. 70 Gert-Jan BOSMAN Destil-Jo Piels s.t. 71 Simone ANTONINI Wanty-Groupe Gobert s.t. 72 Marco DOETS Baby Dump s.t. 73 Justin TIMMERMANS Baby Dump s.t. 74 Jimmy TURGIS Cofidis s.t. 76 Sindre SKJOESTAD LUNKE Sunweb s.t. 77 Joris BLOKKER Monkey Town s.t. 78 Rick VAN BREDA Monkey Town s.t. 79 Thijs AERTS Telenet Fidea s.t. 80 Lukas SPENGLER WB Veranclassic s.t. 81 Patrick VAN DER DUIN Baby Dump s.t. 82 Dylan BOUWMANS Metec-TKH s.t. 83 Folkert OOSTRA Baby Dump s.t. 84 Twan VAN DEN BRAND Destil-Jo Piels s.t. 85 René HOOGHIEMSTER Baby Dump s.t. 86 Robbert DE GREEF Baby Dump s.t. 87 Maxim BELKOV Katusha Alpecin s.t. 88 Piet ALLEGAERT Sport Vlaanderen-Baloise s.t. 89 Primož ROGLIC Lotto NL-Jumbo s.t. 90 Gijs VAN HOECKE Lotto NL-Jumbo s.t. 91 Gaetan BILLE Veranda's Willems-Crelan s.t. 92 Stijn STEELS Sport Vlaanderen-Baloise s.t. 93 Daan SOETE Telenet Fidea s.t. 94 Eliot LIETAER Sport Vlaanderen-Baloise s.t. 95 Berden DE VRIES Roompot-Nederlandse Loterij s.t. 96 Yannick Detant Monkey Town s.t. 97 Iljo KEISSE Quick-Step s.t. 98 Maximilian SCHACHMANN Quick-Step s.t. 99 Mark MCNALLY Wanty-Groupe Gobert s.t. 100 Jonas RICKAERT Sport Vlaanderen-Baloise s.t. 101 Enzo WOUTERS Lotto Soudal s.t. 102 Laurens TEN DAM Sunweb s.t. 103 Dion BEUKEBOOM Destil-Jo Piels s.t. 104 Joey VAN RHEE Destil-Jo Piels s.t. 106 Stephan BAKKER Monkey Town s.t. 107 Gijs MEIJER Monkey Town s.t. 108 Stijn DEVOLDER Veranda's Willems-Crelan s.t. 109 Loic CHETOUT Cofidis s.t. 110 Jasper HAMELINK Metec-TKH s.t. 111 Rens TE STROET Destil-Jo Piels s.t. 112 Stan GODRIE Veranda's Willems-Crelan s.t. 113 Jarno GMELICH MEIJLING Metec-TKH s.t. 114 Tijmen EISING Metec-TKH s.t. 3 Maximilian SCHACHMANN Quick-Step s.t. 14 Jasper DE BUYST Lotto Soudal s.t. 15 Robert Thomas WAGNER Lotto NL-Jumbo s.t. 16 Gijs VAN HOECKE Lotto NL-Jumbo s.t. 17 José GONÇALVES Katusha Alpecin s.t. 18 Marco MATHIS Katusha Alpecin s.t. 22 Thomas LEEZER Lotto NL-Jumbo s.t. 25 Maarten WYNANTS Lotto NL-Jumbo s.t. 26 Dion BEUKEBOOM Destil-Jo Piels s.t. 28 Brian VAN GOETHEM Roompot-Nederlandse Loterij s.t. 29 Maxim BELKOV Katusha Alpecin s.t. 30 Lars VAN DER HAAR Telenet Fidea s.t. 31 Alex KIRSCH WB Veranclassic s.t. 33 Rick OTTEMA Baby Dump s.t. 36 Berden DE VRIES Roompot-Nederlandse Loterij s.t. 38 Nicolas CLEPPE Telenet Fidea s.t. 41 Zico WAEYTENS Sunweb s.t. 42 Pim LIGTHART Roompot-Nederlandse Loterij s.t. 44 Thijs AERTS Telenet Fidea s.t. 45 Jenthe BIERMANS Katusha Alpecin s.t. 46 Lars Ytting BAK Lotto Soudal s.t. 48 Xandro MEURISSE Wanty-Groupe Gobert s.t. 49 Peter SCHULTING Destil-Jo Piels s.t. 51 Coen VERMELTFOORT Roompot-Nederlandse Loterij s.t. 54 Sindre SKJOESTAD LUNKE Sunweb s.t. 57 Laurens TEN DAM Sunweb s.t. 58 Dries DE BONDT Veranda's Willems-Crelan s.t. 59 Dries VAN GESTEL Sport Vlaanderen-Baloise s.t. 60 Preben VAN HECKE Sport Vlaanderen-Baloise s.t. 62 Bert VAN LERBERGHE Sport Vlaanderen-Baloise s.t. 64 Julien STASSEN WB Veranclassic s.t. 65 Fabio SABATINI Quick-Step s.t. 66 Timothy DUPONT Veranda's Willems-Crelan s.t. 71 Viacheslav KUZNETSOV Katusha Alpecin s.t. 72 Daan SOETE Telenet Fidea s.t. 73 Simone ANTONINI Wanty-Groupe Gobert s.t. 74 Sjoerd VAN GINNEKEN Roompot-Nederlandse Loterij s.t. 76 Joris BLOKKER Monkey Town s.t. 78 Gert-Jan BOSMAN Destil-Jo Piels s.t. 83 Twan VAN DEN BRAND Destil-Jo Piels s.t. 86 Marco DOETS Baby Dump s.t. 94 Dylan BOUWMANS Metec-TKH s.t. 99 Johannes FRÖHLINGER Sunweb s.t. The race: Here's the story from stage winner Dylan Groenewegen's LottoNL-Jumbo team. 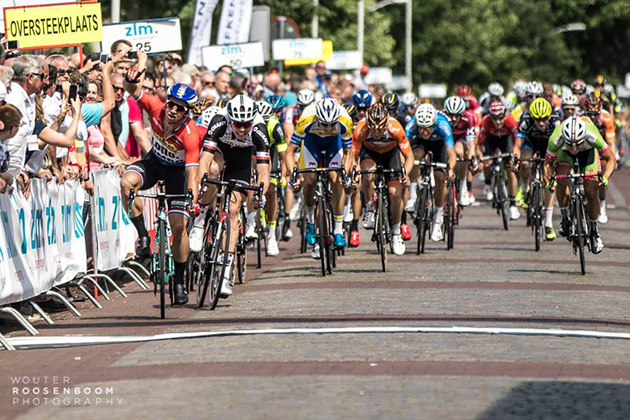 Dylan Groenewegen sprinted to victory in the second stage of the Ster ZLM Toer today in Hoogerheide, The Netherlands. LottoNL-Jumbo team-mate Primoz Roglic, winner of yesterday’s prologue time trial, remained the overall leader. Groenewegen’s win was the 15th for Team LottoNL-Jumbo this 2017 season. For the Dutchman, it marked his fourth victory. During the stage Team LottoNL-Jumbo tried to force the bunch into echelons. “At a given moment, a group of 14 men, with six of our riders had a gap on the rest. I think we rode a strong race. We controlled from the start to the finish." “It was a though day”, Sports Director Merijn Zeeman said. “It was hot and there was a continuing threat of the wind forming echelons. After a hectic start, a group of six men broke away. Because of that, we could control the race with Twan Castelijn and Gijs Van Hoecke." 2 Max WALSCHEID Sunweb s.t. 4 Coen VERMELTFOORT Roompot-Nederlandse Loterij s.t. 5 Bert VAN LERBERGHE Sport Vlaanderen-Baloise s.t. 6 Tim MERLIER Veranda's Willems-Crelan s.t. 7 Arvid DE KLEIJN Baby Dump s.t. 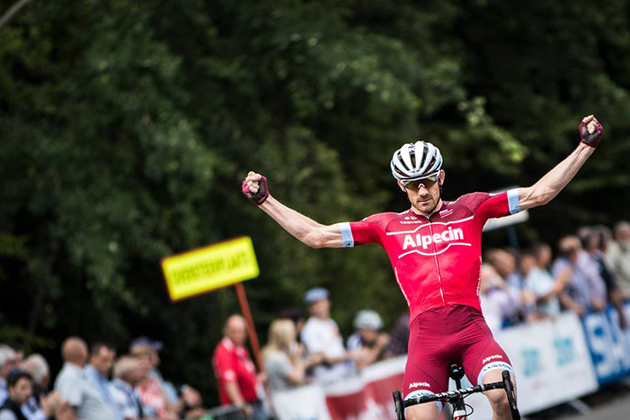 8 Mads Würtz SCHMIDT Katusha Alpecin s.t. 9 Raymond KREDER Roompot-Nederlandse Loterij s.t. 10 Andre LOOIJ Roompot-Nederlandse Loterij s.t. 11 Hugo Hofstetter Cofidis s.t. 12 Kevin ISTA WB Veranclassic s.t. 13 Toon AERTS Telenet Fidea s.t. 14 Michael GOOLAERTS Veranda's Willems-Crelan s.t. 15 Lars VAN DER HAAR Telenet Fidea s.t. 16 Corne VAN KESSEL Telenet Fidea s.t. 17 Jasper DE LAAT Metec-TKH s.t. 18 Thijs AERTS Telenet Fidea s.t. 19 José GONÇALVES Katusha Alpecin s.t. 20 Dries DE BONDT Veranda's Willems-Crelan s.t. 21 Twan BRUSSELMAN Destil-Jo Piels s.t. 22 Marcel KITTEL Quick-Step s.t. 23 Yannick Detant Monkey Town s.t. 24 Pim LIGTHART Roompot-Nederlandse Loterij s.t. 25 Jasper DE BUYST Lotto Soudal s.t. 26 Piet ALLEGAERT Sport Vlaanderen-Baloise s.t. 27 Bert DE BACKER Sunweb s.t. 28 Marcel SIEBERG Lotto Soudal s.t. 29 Joris BLOKKER Monkey Town s.t. 30 Maxime VANTOMME WB Veranclassic s.t. 31 Florian SENECHAL Cofidis s.t. 32 Timothy DUPONT Veranda's Willems-Crelan s.t. 34 Sébastien DELFOSSE WB Veranclassic s.t. 35 Christophe LAPORTE Cofidis s.t. 37 Eliot LIETAER Sport Vlaanderen-Baloise s.t. 38 Lennard KÄMNA Sunweb s.t. 39 Sjoerd VAN GINNEKEN Roompot-Nederlandse Loterij s.t. 40 Jenthe BIERMANS Katusha Alpecin s.t. 41 Primož ROGLIC Lotto NL-Jumbo s.t. 42 Søren Kragh ANDERSEN Sunweb s.t. 43 Rémi Cavagna Quick-Step s.t. 44 Kenny DEHAES Wanty-Groupe Gobert s.t. 45 Wesley KREDER Wanty-Groupe Gobert s.t. 46 Xandro MEURISSE Wanty-Groupe Gobert s.t. 47 Fabien DOUBEY Wanty-Groupe Gobert s.t. 48 Timo ROOSEN Lotto NL-Jumbo s.t. 49 Laurens DE PLUS Quick-Step s.t. 50 Thomas SPRENGERS Sport Vlaanderen-Baloise s.t. 51 Maarten DE JONGE Monkey Town s.t. 52 Antoine WARNIER WB Veranclassic s.t. 53 Marco MATHIS Katusha Alpecin s.t. 54 Dries VAN GESTEL Sport Vlaanderen-Baloise s.t. 55 Robert Thomas WAGNER Lotto NL-Jumbo s.t. 57 Jim LINDENBURG Metec-TKH s.t. 58 Preben VAN HECKE Sport Vlaanderen-Baloise s.t. 59 Simone ANTONINI Wanty-Groupe Gobert s.t. 60 Zico WAEYTENS Sunweb s.t. 61 Jim AERNOUTS Telenet Fidea s.t. 62 Gijs VAN HOECKE Lotto NL-Jumbo s.t. 63 Julien STASSEN WB Veranclassic s.t. 64 Berden DE VRIES Roompot-Nederlandse Loterij s.t. 65 Rick OTTEMA Baby Dump s.t. 66 Peter SCHULTING Destil-Jo Piels s.t. 67 Alex KIRSCH WB Veranclassic s.t. 68 Lukas SPENGLER WB Veranclassic s.t. 69 Quinten HERMANS Telenet Fidea s.t. 70 René HOOGHIEMSTER Baby Dump s.t. 71 Thomas LEEZER Lotto NL-Jumbo s.t. 72 Jarno GMELICH MEIJLING Metec-TKH s.t. 73 Twan VAN DEN BRAND Destil-Jo Piels s.t. 74 Brian VAN GOETHEM Roompot-Nederlandse Loterij s.t. 75 Lars Ytting BAK Lotto Soudal s.t. 76 Joey VAN RHEE Destil-Jo Piels s.t. 77 Sjoerd KOUWENHOVEN Metec-TKH s.t. 78 Nicolas CLEPPE Telenet Fidea s.t. 79 Justin TIMMERMANS Baby Dump s.t. 80 Michaël VAN STAEYEN Cofidis s.t. 81 Marco DOETS Baby Dump s.t. 82 Maxim BELKOV Katusha Alpecin s.t. 83 Maarten WYNANTS Lotto NL-Jumbo s.t. 84 Gert-Jan BOSMAN Destil-Jo Piels s.t. 85 Dion BEUKEBOOM Destil-Jo Piels s.t. 86 Sindre SKJOESTAD LUNKE Sunweb s.t. 87 Gregory HABEAUX WB Veranclassic s.t. 88 Oscar RIESEBEEK Roompot-Nederlandse Loterij s.t. 89 Laurens TEN DAM Sunweb s.t. 90 Kevin VAN MELSEN Wanty-Groupe Gobert s.t. 91 Robbert DE GREEF Baby Dump s.t. 95 Dylan BOUWMANS Metec-TKH s.t. 96 André GREIPEL Lotto Soudal s.t. 97 Jelle NIEUWPOORT Metec-TKH s.t. 98 Mark MCNALLY Wanty-Groupe Gobert s.t. 100 Loic CHETOUT Cofidis s.t. 101 Tim KERKHOF Destil-Jo Piels s.t. 102 Daan SOETE Telenet Fidea s.t. 103 Patrick VAN DER DUIN Baby Dump s.t. 104 Tijmen EISING Metec-TKH s.t. 105 Stan GODRIE Veranda's Willems-Crelan s.t. 106 Stijn STEELS Sport Vlaanderen-Baloise s.t. 114 Marco ZANOTTI Monkey Town s.t. 116 Gaetan BILLE Veranda's Willems-Crelan s.t. 117 Rick VAN BREDA Monkey Town s.t. 119 Jasper HAMELINK Metec-TKH s.t. 13 Jasper DE BUYST Lotto Soudal s.t. 14 Robert Thomas WAGNER Lotto NL-Jumbo s.t. 15 Gijs VAN HOECKE Lotto NL-Jumbo s.t. 16 José GONÇALVES Katusha Alpecin s.t. 17 Marco MATHIS Katusha Alpecin s.t. 20 Thomas LEEZER Lotto NL-Jumbo s.t. 22 Tim MERLIER Veranda's Willems-Crelan s.t. 24 Dylan GROENEWEGEN Lotto NL-Jumbo s.t. 44 Jenthe BIERMANS Katusha Alpecin s.t. 45 Lars Ytting BAK Lotto Soudal s.t. 48 Peter SCHULTING Destil-Jo Piels s.t. 50 Coen VERMELTFOORT Roompot-Nederlandse Loterij s.t. 53 Sindre SKJOESTAD LUNKE Sunweb s.t. 56 André GREIPEL Lotto Soudal s.t. 65 Julien STASSEN WB Veranclassic s.t. 66 Fabio SABATINI Quick-Step s.t. 67 Timothy DUPONT Veranda's Willems-Crelan s.t. 72 Viacheslav KUZNETSOV Katusha Alpecin s.t. 73 Daan SOETE Telenet Fidea s.t. 74 Simone ANTONINI Wanty-Groupe Gobert s.t. 75 Sjoerd VAN GINNEKEN Roompot-Nederlandse Loterij s.t. 79 Gert-Jan BOSMAN Destil-Jo Piels s.t. 80 Hugo Hofstetter Cofidis s.t. 87 Marco DOETS Baby Dump s.t. 97 Dylan BOUWMANS Metec-TKH s.t. 103 Johannes FRÖHLINGER Sunweb s.t. The race: Here's the report from winner Primoz Roglic's LottoNL-Jumbo team. Primoz Roglic won the prologue of the Ster ZLM Toer in Westkapelle, Netherlands, today. The Slovenian started as last rider and was the fastest, clocking eight minutes and four seconds. For Team LottoNL-Jumbo it was the 14th win of the season and the fifth win in a time trial. “This is not my type of time trial," Roglic said. "I like time trials where there are hills in the route. But if I am on the starting line, I give it my all. Today that was enough for the win. I just came back from altitude training in the Sierra Nevada. This race is the last step in my preparation for the Tour de France. Heijboer admits that Roglic is one of the favourites to put on the yellow jersey in Düsseldorf. “There are some other riders who can ride a good prologue, but Primos is obviously one of the favourites." “This is the fifth time trial win for us this year. That is the result of much work in the winter. We were with Primoz on the track and in the wind tunnel, among other things. And we were quite busy with the Shimano clothing, Lazer helmet and the overshoes. Besides that the Bianchi Aquila CV bike is currently the best time trial bike." 10 Marcel SIEBERG Lotto Soudal s.t. 16 Max WALSCHEID Sunweb s.t. 23 Tim MERLIER Veranda's Willems-Crelan s.t. 29 Daan SOETE Telenet Fidea s.t. 30 Maxim BELKOV Katusha Alpecin s.t. 31 Lars VAN DER HAAR Telenet Fidea s.t. 33 Eliot LIETAER Sport Vlaanderen-Baloise s.t. 34 Gaetan BILLE Veranda's Willems-Crelan s.t. 36 Oscar RIESEBEEK Roompot-Nederlandse Loterij s.t. 38 Berden DE VRIES Roompot-Nederlandse Loterij s.t. 40 Nicolas CLEPPE Telenet Fidea s.t. 41 Jasper DE LAAT Metec-TKH s.t. 43 Zico WAEYTENS Sunweb s.t. 44 Pim LIGTHART Roompot-Nederlandse Loterij s.t. 46 Jenthe BIERMANS Katusha Alpecin s.t. 48 Rick OTTEMA Baby Dump s.t. 49 Jasper HAMELINK Metec-TKH s.t. 51 Peter SCHULTING Destil-Jo Piels s.t. 53 Coen VERMELTFOORT Roompot-Nederlandse Loterij s.t. 54 Dylan GROENEWEGEN Lotto NL-Jumbo s.t. 55 Kris BOECKMANS Lotto Soudal s.t. 57 Sébastien DELFOSSE WB Veranclassic s.t. 61 Rens TE STROET Destil-Jo Piels s.t. 62 Tijmen EISING Metec-TKH s.t. 63 Fabien DOUBEY Wanty-Groupe Gobert s.t. 65 Laurens TEN DAM Sunweb s.t. 66 Dries DE BONDT Veranda's Willems-Crelan s.t. 67 Dries VAN GESTEL Sport Vlaanderen-Baloise s.t. 69 René HOOGHIEMSTER Baby Dump s.t. 70 Bert VAN LERBERGHE Sport Vlaanderen-Baloise s.t. 74 Wesley KREDER Wanty-Groupe Gobert s.t. 75 Julien STASSEN WB Veranclassic s.t. 76 Fabio SABATINI Quick-Step s.t. 78 Piet ALLEGAERT Sport Vlaanderen-Baloise s.t. 79 Stan GODRIE Veranda's Willems-Crelan s.t. 81 Stijn STEELS Sport Vlaanderen-Baloise s.t. 83 Stijn DEVOLDER Veranda's Willems-Crelan s.t. 87 Dylan BOUWMANS Metec-TKH s.t. 89 Mark MCNALLY Wanty-Groupe Gobert s.t. 90 Viacheslav KUZNETSOV Katusha Alpecin s.t. 91 Lars Ytting BAK Lotto Soudal s.t. 91 Simone ANTONINI Wanty-Groupe Gobert s.t. 93 Sjoerd VAN GINNEKEN Roompot-Nederlandse Loterij s.t. 96 Andre LOOIJ Roompot-Nederlandse Loterij s.t. 97 Rick VAN BREDA Monkey Town s.t. 98 Gert-Jan BOSMAN Destil-Jo Piels s.t. 99 Hugo Hofstetter Cofidis s.t. 102 Thomas SPRENGERS Sport Vlaanderen-Baloise s.t. 105 Danilo NAPOLITANO Wanty-Groupe Gobert s.t. 107 Twan VAN DEN BRAND Destil-Jo Piels s.t. 110 Marco DOETS Baby Dump s.t. 112 Justin TIMMERMANS Baby Dump s.t. 116 Gregory HABEAUX WB Veranclassic s.t.